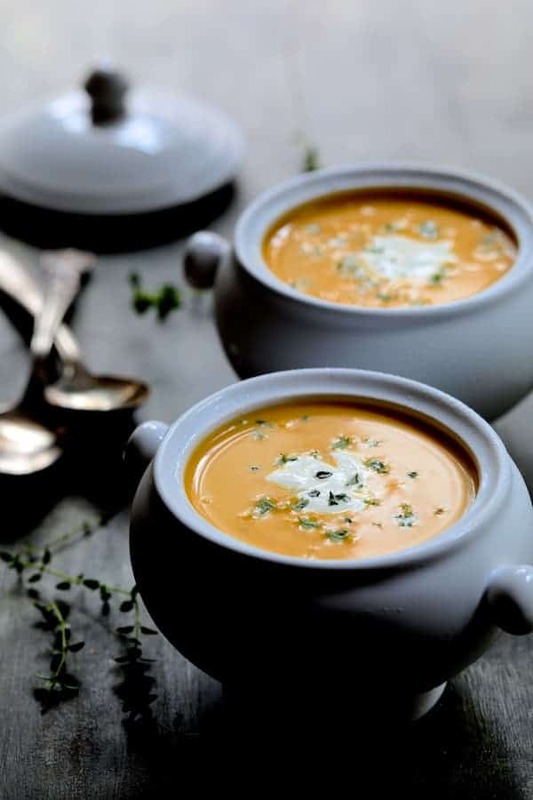 Butternut Squash Soup with Thyme and Taleggio is an elegant, rich and creamy soup that’s perfect to serve this fall and winter! Butternut squash is my favorite of all the winter squash because it’s so versatile and it’s the easiest to peel. First, select one with a nice long neck. Slice the neck into approximately 3-inch lengths. Place the cut side down on a cutting board and with a sharp knife, slice downward toward your cutting board rotating the squash as you remove the thick peel. To peel the bottom of the squash (the part with seeds), slice it in half vertically down to where the blossom was. Place the seed side down on a cutting board and slice into ½ to 1-inch half-moons. Then, remove the peel, seeds and fibrous interior with a paring knife and cube the remaining flesh. Seriously. That’s it! Here’s a photo of how I do it in this post for Lemony Quinoa with Butternut Squash, Almonds and Parmesan Cheese. Taleggio cheese is another huge favorite of mine. It’s one of the oldest cheeses in the world. Produced in Italy, Taleggio is finished aging in the fall so it’s perfect to enjoy in numerous ways this time of year. Best of all, it’s somewhat fruity yet tangy flavor with butternut squash is a culinary match made in heaven! 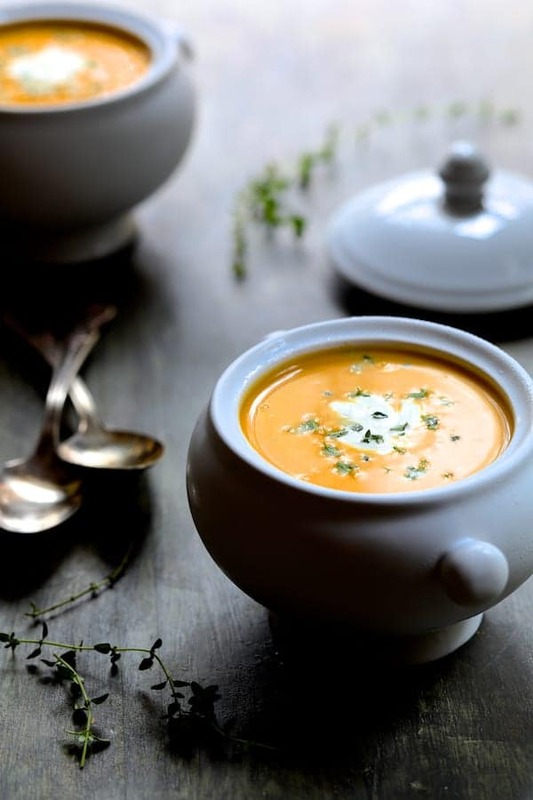 I highly recommend using fresh thyme for this soup. Dried thyme can overwhelm a dish and may actually turn bitter. If you do use dried, reduce the amount used by half which is the general rule of thumb when substituting dried for fresh herbs. In other words, instead of 1 tablespoon of a fresh herb, use no more than 1 1/2 teaspoons or 1 teaspoon dried. 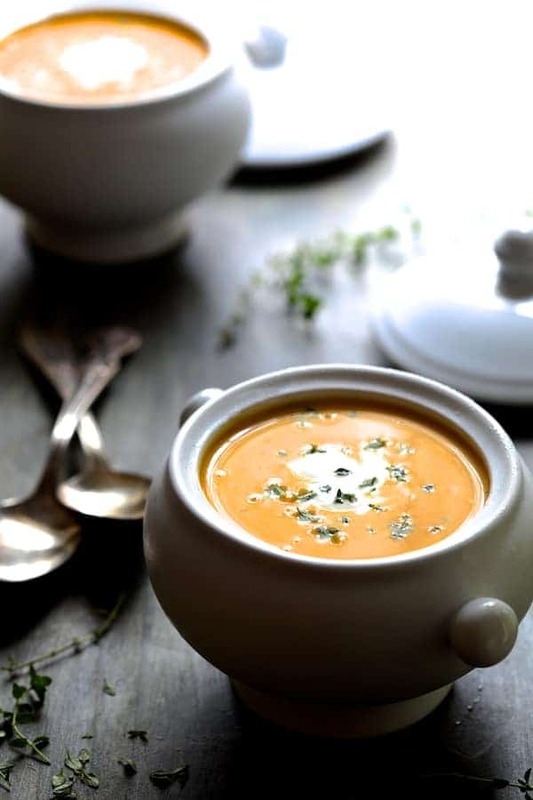 To puree this soup into silky smoothness, use an immersion blender. If you don’t have one, you need to get one! 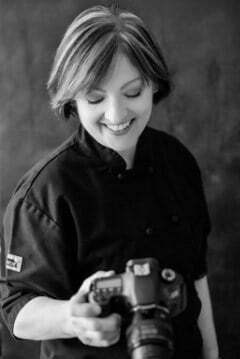 An immersion blender will make your life so much easier! However, if using a food processor or blender, be very careful with hot liquids and puree in batches. 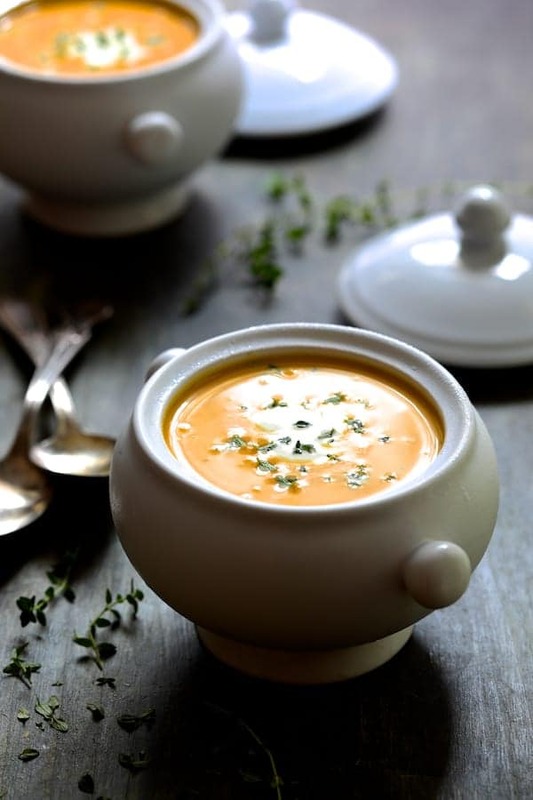 Butternut Squash Soup with Thyme and Taleggio is a simply beautiful soup that will become an annual favorite! 1 1/2 teaspoons dried thyme may be used in place of 1 tablespoon fresh thyme. However, dried herbs should be added earlier in the cooking process, not toward the end.